Our wheel covers are made from high quality marine UV treated marine vinyls and custom sized to exactly suit your tyre. This gives the highest quality result, and ensures a great fit. Many inferior covers are made from cheap banner materials that are neither designed for the purpose or look very effective. Completely Australian Made, for the tough Australian conditions, we are confident you will have a long lasting, UV resistant product, that will enhance you vehicle look or promote your business in a professional way. The lifespan of the cover is dependant on many factors which include the exposure to rain, sun, and maintenance. Our wheel covers also include a piping around the face of the cover which can be either black or white. This piping helps in strengthing and ensures a better sitting cover. Many inferior products do not have this. The PREMIUM covers are printed in photographic quality with images having vivid, long lasting colour, creating a truly high impact visual display. We also have a STANDARD RANGE of stock covers, which are screen printed to reduce costs for you. To tension the cover around the tyre correctly, a heavy duty grade elastic is sewn on the inside of the cover, making it easy to take on and off when needed. There is also a piping, which can be in either black or white, that add strength and flexibilty to the covers. We believe our covers are of a premium quality at a great price, and care is taken to ensure everything from design to print to manufacture is of the highest standard. As our covers a made to suit, please allow up to 10 working days for manufacture, plus delivery times. Please feel free to contact us if further information is required on our custom made wheel covers. 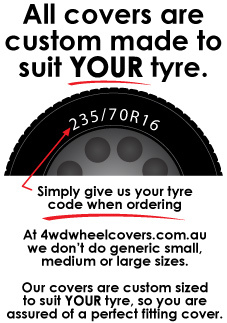 Please read our conditions for further details when purchasing our 4wd wheel covers.